Appendicitis occurs when appendix opening gets blocked. 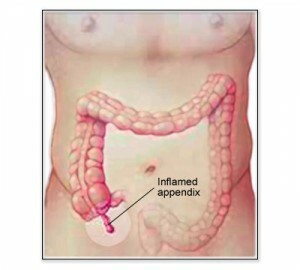 As a result, inflammation occurs (appendicitis). Continuous blockage causes accumulation of bacteria which usually die because of absence of blood supply. This can rupture appendix. Appendicitis is a condition, which is common and affects individuals of all ages. Elder and young people are common victims of this disease. Sometimes body recovers without appendicitis surgery. Appendicitis symptoms can disappear if infection do not spread throughout the body especially abdomen. The prevention can be achieved though the use of antibiotics. The patients may complain a lump in their right lower abdomen which can give an indication of cancer.